Elkay Professional Series NSF Stainless Steel Table with Backsplash Adjustable Height Feet and Undershelf, 36" x 30"
Elkay's line of Economy Work Tables are built to meet your every food service, hospitality, and commercial business need. 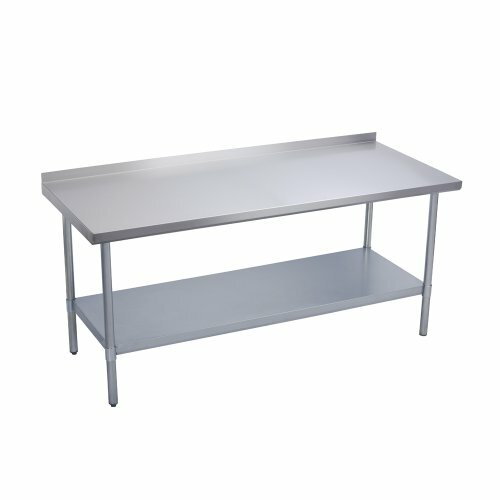 Whether you are looking for a larger food prep surface, additional storage room, or simply more work area, this line of 18 gauge stainless steel tables are durable and feature an under shlef for added space and stability. As with all of Elkay's work tables, the Economy Series is NSF certified for all food service use. SPECIFICATIONS: 36"x30" 18 gauge 400 series stainless steel 2" backsplash with 1" return and 1-3/4" turned-down edge. MATERIALS - TOP: 18 Gauge, 400 series stainless steel LEGS: 1-5/8" Diameter heavy gauge galvanized tubing with galvanized leg gussets and high impact plastic feet, adjustable up to 1" UNDERSHELF: 18 gauge galvanized steel. FEATURES - NSF certified for food service application. Fully adjustable undershelf with 1-1/2" turned-down edge welded to adjustable galvanized leg rings secured with Allen screws (wrench supplied), Sound deadened between top and bottom hat channels with double sided tape, Feet adjustable up to 1"
If you have any questions about this product by Elkay Foodservice, contact us by completing and submitting the form below. If you are looking for a specif part number, please include it with your message.